Provide comfort for the family of Kenny Drussel with a meaningful gesture of sympathy. It is with a heavy heart that we share the passing of our loved one, Kenny Wayne Drussel, on January 28, 2019. Kenny was the first to be born up Muldoon Canyon at the Peavey Ranch on March 25, 1950 to Harold and Dorothy Drussel. It was during a large snow storm, and Kenny’s dad had to deliver him with the help of the party phone line. Kenny’s dad jokes that he thought it was the “ugliest baby ever.” They were flown out a few days later by snow plane. Kenny graduated from Wood River High School and attended Boise State University. He grew up to be a beautiful man with a great big heart. Kenny, and his partner in crime since 1977, Jane, started Jane’s Paper Place in 1985 and Jane’s Artifacts in 2009. Kenny has been a pillar in the community and his first love was helping children. He was always warm and friendly with a beautiful smile. Kenny is survived by his wife, Jane; her sons Jay, Joe (Lorraine), David (Jade) and Mike (Robyn); granddaughters Lauren, Rachael, Isla, Ruby and Jenny; grandsons, Lucas, Duncan and Sean; his father, Harold Drussel; his stepmom, Carol; his brothers Zane (Cindy) and Brad and his sister Rellis as well as many loving extended family members. He was preceded in death by his Mom, Dorothy and his brother, Ross. Donations in Kenny’s memory may be made to St. Jude Children’s Research Hospital. Memorial services will be conducted at 2:00 p.m., Saturday February 23, 2019, at Calvary Bible Church, 102 Coyote Bluff Drive, Hailey, Idaho. 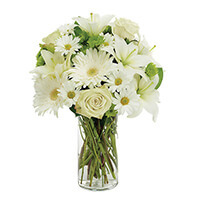 To send flowers in memory of Kenny Wayne Drussel, please visit our Heartfelt Sympathies Store. We encourage you to share your most beloved memories of Kenny here, so that the family and other loved ones can always see it. You can upload cherished photographs, or share your favorite stories, and can even comment on those shared by others. Linda sent flowers to the family of Kenny Wayne Drussel. I only met Kenny twice and knew that he was a gentle soul. Blessings to Jane and family during this difficult time. Linda purchased the PEACEFUL WISHES for the family of Kenny Drussel. Ken's spirit represents the very best of our beautiful valley and the special, special people that live here. It is hard to imagine the valley without him and I know we'll see him every day when the spring flowers bloom through the snow, the summer sun shines down on us, the leaves turning golden and red in the fall, and winter settles its blanket of snow. Jane know you are loved by so many and we are all here for you and your family.